Custodial Trap: The Game társasjáték - Magyarország társasjáték keresője! A társasjáték érték! A Custodial Trap: The Game egy nagyszerű társasjáték, 2 játékos részére. 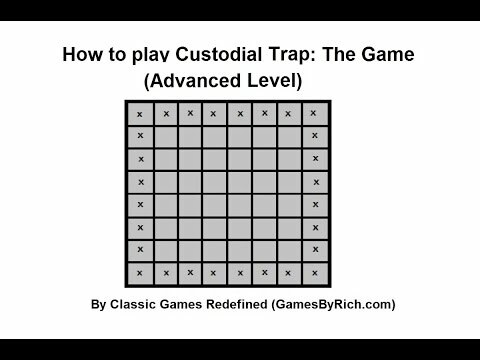 Custodial Trap: The Game is a game created to show off the Custodial Trap move type seen in a number of games designed by Rich Hutnik. The move type is akin to Custodial Capture seen in Tafl family of games, or Custodial Conversion seen in Othello/Reversi. 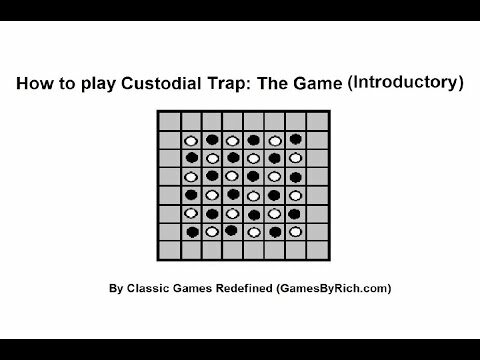 The custodial trap move involves two pieces bookending a line of enemy pieces, and freezing them so they can't move. In a future turn, one of the two pieces freezing enemy pieces, which isn't also trapped, can then move one space and occupy an enemy piece that it is freezing, and capture it. 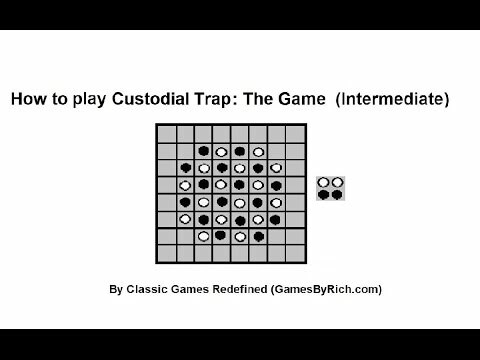 Custodial Trap: The Game, is played on an 8x8 chessboard with 18 pieces each in two different colors that are identical. Chess pawns or checkers work. In the basic game, the pieces are set up in a 6x6 alternating pattern of of opposing pieces, that form a checkerboard pattern. Pieces on the corners are the only ones free. Object of the basic game is to either prevent one's opponent from having no legal moves or capturing at least 12 of their opponent's pieces. The advanced version of the game, introduces a new win condition of a player connecting all their not capture pieces into oone orthogonally connected group of piece. In addition, players also can start with pieces off the board, and one player sets up the pieces for both players, and the other player picks what side to play, utilizing a Limited Dutch Offer (this is an extended version of the pie rule). How to play the Advanced level of the game. How to play the Intermediate level of the game.